The year 2016 was a year of change in national and provincial leadership and was a very productive period for the Province of Bohol. Significant achievements were made by our local governance that were brought about by thinking outside the box and institutionalizing innovations. 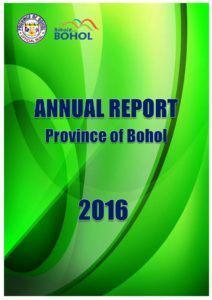 As the Local Chief Executive of Bohol, it is with pride and honor that I present this Annual Report for CY 2016. It focuses our major accomplishments based on InSPIRED HEAT-IT Bohol, the overarching development framework of the Provincial Government of Bohol. From the previous HEAT IT Bohol development agenda, InSPIRED Bohol was added to sustain and emphasize our development priorities on Infrastructure, Social Well-being, Peace and Order, Interconnectivity, Reforms in Local Governance, Environmental Sustainability, Disaster Risk Reduction and Management and Climate Change Adaptation, and Boholano Culture and Heritage Preservation. This Annual Report is a consolidation of the achievements of the past Chatto-Lim administration in the first half of 2016, and the Chatto-Balite administration in the later half of the year. This is my last term as Chief Executive of the Province of Bohol and I am proud to inform all concerned taht I have built on the accomplishments of the past administrations and prepared the major forthcoming plans and programs for the incoming administration in 2019. 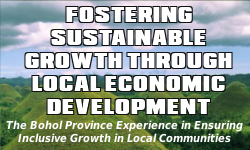 The achievements of the Provincial Government of Bohol would not have been made possible without legislative support from the Sangguniang Panlalawigan as well as active participation of multi-sectoral stakeholders to realize the legacy programs and projects for Bohol’s continued sustainable development. As we push forward with our development plan for 2017, we shall take note of areas for further improvement from our accomplishments for CY 2016 so we can perform with more efficiency, effectiveness and economy, and I shall count upon the support and cooperation from all sectors to sustain and even surpass the 2016 accomplishments.